"Port Stanley" redirects here. For the town in Canada, see Port Stanley, Ontario. For the legislative constituency, see Stanley (constituency). Stanley is the main shopping centre on the islands and the hub of East Falkland's road network. Attractions include the Falkland Islands Museum, Government House – built in 1845 and home to the Governor of the Falkland Islands – and a golf course, as well as a whale-bone arch, a totem pole, several war memorials and the shipwrecks in its harbour. The Falkland Islands Company owns several shops. Stanley has four pubs, 11 hotels and guesthouses, three restaurants, a fish and chip shop and the main tourist office. There are three churches, including the Anglican Christ Church Cathedral, the southernmost Anglican cathedral in the world, and the Roman Catholic St. Mary's Church. A bomb disposal unit in the town is a legacy of the Falklands War. The town hall serves as a post office, philatelic bureau, law court and dance hall. The police station also contains the islands' only prison, with a capacity of 13 in the cells. The community centre includes a swimming pool (the only public one in the islands), a sports centre, library, and school. A grass football pitch is located by the community centre and hosts regular games. Stanley Racecourse, located on the west side of Stanley, holds a two-day horse racing meeting every year on 26 and 27 December. The Christmas races have been held here for over 100 years. Stanley Golf Course has an 18-hole course and a club house. It is also located to the west of Stanley. King Edward VII Memorial Hospital is the islands' main hospital, with doctors' practice and surgery, radiology department, dental surgery and emergency facilities. Several bus and taxi companies operate out of Stanley. 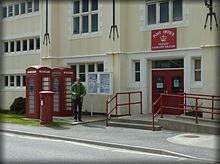 Stanley is also home to the Falkland Islands Radio Station (FIRS), the Stanley office of the British Antarctic Survey, and the office of the weekly Penguin News newspaper. A nursery and garden centre is also here, in whose greenhouses some of the islands' vegetables are grown. The original capital of the islands was at Port Louis to the north of the present site of Stanley, on Berkeley Sound. Captains Francis Crozier and James Clark Ross were recruited by Governor Richard Moody in his quest to find a new capital for The Falklands. Both Crozier and Ross (who are remembered in Crozier Place and Ross Road in Stanley) were among the Royal Navy's most distinguished seafarers. They spent five months in the islands with their ships Terror and Erebus. 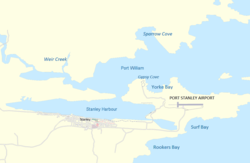 Governor Moody (after whom Moody Brook is named) however, decided to move the capital to Port Jackson, which was renamed "Stanley Harbour", after a survey. Stanley Harbour was considered to have a deeper anchorage for visiting ships. Not all the inhabitants were happy with the change, notably one JW Whitington is recorded as saying, "Of all the miserable bog holes, I believe that Mr Moody has selected one of the worst for the site of his town." Work on the settlement began in 1843 and it became the capital in July 1845. It was named after Lord Stanley, Secretary of State for War and the Colonies at the time. In 1849, 30 married Chelsea Pensioners were settled there to help with the defence of the islands and to develop the new settlement. The settlement soon grew as a deep-water port, specialising at first in ship repairs; indeed, before the construction of the Panama Canal, Port Stanley was a major repair stop for ships travelling through the Straits of Magellan. The rough waters and intense storms found at the tip of the continent forced many ships to Stanley Harbour, and the ship repair industry helped to drive the island economy. Later it became a base for whaling and sealing in the South Atlantic and Antarctic. Later still it was an important coaling station for the Royal Navy. This led to ships based here being involved in the Battle of the Falkland Islands in the First World War, and the Battle of the River Plate in the Second World War. Landslides (peatslips), caused by excessive peat cutting, destroyed part of the town in 1879 and 1886, the second landslide killing two people. At about midnight on 29 November 1878 a black moving mass, several feet high, was moving forwards at a rate of four or five mph. The next morning the town was cut in two; the only way to travel between the two parts was by boat. During the Second World War, a hulk in Stanley Harbour was used for interning the British Fascist and Mosleyite Jeffrey Hamm. Something of a minor player in the BUF due to his youth, Hamm moved to the Falkland Islands in 1939 to work as a teacher. He was arrested there in 1940 for his BUF membership (under Defence Regulation 18B) and later transferred to a camp in South Africa. Released in 1941 he was later called up to the Royal Armoured Corps and served until his discharge in 1944. Stanley Airport is used by internal flights and provides connections to British bases in Antarctica. It was opened by the Argentine Air Force on 15 November 1972 (previously, international flights were by seaplane from Comodoro Rivadavia). Flights to Argentina ended after the 1982 conflict. A weekly flight to Punta Arenas in Chile commenced in 1993, which now operates out of Mount Pleasant Airbase (RAF Mount Pleasant). Scheduled passenger flights between the Mount Pleasant airfield and the UK are also operated twice a week by a civilian airline contractor on behalf of the Royal Air Force. Stanley was occupied by Argentine troops for about 10 weeks during the Falklands War in 1982. The Argentines renamed the town Puerto Argentino, and although Spanish names for places in the Falklands were historically accepted as alternatives, this one is considered to be extremely offensive by many islanders. Stanley suffered considerable damage during the war, from both the Argentine occupation and the British naval shelling of the town, which killed three civilians. After the British secured the high ground around the town the Argentines surrendered with no fighting in the town itself. The beaches and land around it were heavily mined and some areas remain marked minefields. Since the Falklands War, Stanley has benefited from the growth of the fishing and tourism industries in the Islands. Stanley itself has developed greatly in that time, with the building of a large amount of residential housing, particularly to the east of the town centre. Stanley is now more than a third bigger than it was in 1982. There is some difficulty over the correct name of the capital. Early despatches contain reference to both Port Stanley and Stanley. Port Stanley was accepted by the Naming Commission set up in 1943 to consider the names then being included on the War Office maps. Local opinion differs on the matter, but there is no doubt that Stanley is now common usage and has been for some considerable time. The capital is defined as Stanley in the Interpretation and General Law Ordinance. In the circumstances I would advise that the correct name for the capital is Stanley. Falklanders often refer to it simply as "Town". 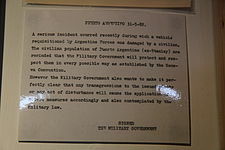 A message issued by the Argentine Military Governor during the occupation in which the capital is referred to as "Puerto Argentino (ex-Stanley)". 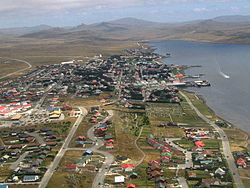 Puerto Soledad (the port of East Falkland, known in Spanish as Isla Soledad) – reported in 1965, but in fact the old Spanish name of Port Louis, the old capital, not Stanley. Puerto Rivero – a reference to Antonio Rivero, a controversial Argentine figure in the early history of the islands. Used by peronists and the hijackers of Aerolineas Argentinas Flight 648 who landed at Stanley in September 1966. It was also used for 3–4 April 1982 after the Argentine invasion. Puerto de la Isla Soledad – a variant on Puerto Soledad. Used 5 April 1982. 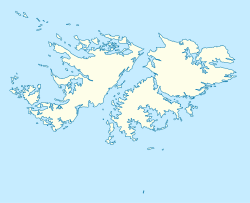 Puerto de las Islas Malvinas (Port of the Malvinas/Falklands), used from 6–20 April 1982. 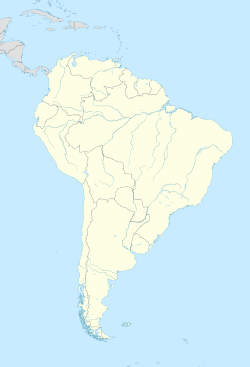 Puerto Argentino – (Port Argentine), used ever since 21 April 1982 by the Argentines, although in 1994 the Argentine Government signed an undertaking to review toponymy relating to the Argentine occupation of the islands. The climate of Stanley is classified as a subpolar oceanic climate (Cfc), as the mean temperature is greater than 10 °C (50 °F) for two months of the year, bordering very closely on a tundra climate. Unlike typical tundra climates, however, the winters are very mild and vegetation grows there that normally couldn't in a climate this close to being a polar climate. The Falkland Islands have displayed a warming trend in recent years; the mean daily January maximum for Mount Pleasant for the years 1991–2011 is 16.5 °C (61.7 °F) compared to Stanley's 1961–90 average of 14.1 °C (57.4 °F). Previously, Stanley had a tundra climate (ET), due to cool summer temperatures (the mean temperature was less than 10 °C (50 °F) in the warmest month). It is characterised, like the rest of the archipelago, by more or less even temperatures through the year and strong westerlies. Precipitation, averaging 544 mm (21.417 in) a year, is nonetheless relatively low, and evenly spread throughout the year. Typically, at least 1 mm (0.039 in) of rain will be recorded on 125.2 days of the year. The islands receive 36.3% of possible sunshine, or around 1500–1600 hours a year, a level similar to Southern parts of England. Daytime temperatures are similar to the Northern Isles of Scotland, though nights tend to be somewhat colder, with frost occurring on more than 1 in 3 nights (128.4 nights). Snow occurs in the winter. Stanley is located at a similar distance from the equator as British warm-summer marine areas Cardiff and Bristol, illustrating the relative chilliness of the climate. In the northern hemisphere, lowland tundra areas are located at latitudes further from the tropics. Many European capitals are also located much farther from the tropics than Stanley is. The nearest larger city of Río Gallegos in Argentina has a slightly milder climate (annual mean temperature being 1.7 °C (3.1 °F) higher) due to its position on the South American mainland, although summers everywhere on this latitude in the Southern hemisphere are very cool due to great marine effects. Temperature extremes at Stanley vary from −11.1 °C (12.0 °F) to 26.1 °C (79.0 °F). [better source needed][self-published source] More recently, on 23 January 1992, nearby Mount Pleasant Airport recorded 29.2 °C (84.6 °F). The Stanley Infant & Junior School (IJS) is located along John Street at the intersection with Villiers Street in Stanley. The school first opened in 1955 and has about 250 students between the ages of four and 11. The Falkland Island Community School (FICS) is located on Reservoir Road in Stanley. It has approximately 150 students between 11 and 16. Gypsy Cove, known for its Magellanic penguins, and Cape Pembroke, the easternmost point of the Falklands, lie nearby. Gypsy Cove is four miles (6 km) from Stanley and can be reached by taxi or on foot. Today, roughly one third of the town's residents are employed by the government and tourism is also a major source of employment. On days when two or more large cruise ships dock in the town tourists frequently outnumber the local residents. Peat was once a prominent heating/fuel source in Stanley, and stacks of drying peat under cover can still be seen by the occasional house. Stanley is twinned with Whitby in North Yorkshire, and Airdrie in North Lanarkshire, both in the United Kingdom. ^ "2016 Census Report". Policy and Economic Development Unit, Falkland Islands Government. 2017. Archived from the original (PDF) on 2018-01-24. ^ "Peat Flood in the Falkland Islands". The Cornishman (43). 8 May 1879. p. 6. ^ "The Toponymy of the Falkland Islands as recorded on Maps and in Gazetteers" (PDF). The Permanent Committee on Geographical Names. July 2006. Archived from the original (PDF) on 22 October 2012. Retrieved 8 March 2013. ^ a b "Average Weather For Falkland Islands". WeatherSpark. Retrieved 11 May 2016. ^ "Climate Mount Pleasant Airport from 1985 to 2013". tutiempo.net. Retrieved 8 March 2013. ^ "Extreme temperatures around the world". mherrera.org. Retrieved 8 March 2013. ^ "Climate Mount Pleasant Airport January 1992". tutiempo.net. Retrieved 8 March 2013. ^ "Falkland Islands Climate". Climatic Research Unit, University of East Anglia. Retrieved 8 March 2013. ^ Herbert, Ian (25 February 2000). "Whitby faces dilemma as one of world's great jaw bones starts showing". The Independent. Retrieved 30 December 2018. ^ Reilly, Hugh (1 April 2013). "Hugh Reilly: Twins aren't a magic fix for failing schools". www.scotsman.com. Retrieved 30 December 2018. ^ "MacDonald Hobley". Find A Grave. Retrieved 8 August 2008. ^ "The Interludes and The Announcers". Whirligig TV history. Retrieved 8 August 2008. ^ David Usborne (10 March 2013). "Falklands referendum: Why ask British people if they want to be British? Alejandro Betts, formerly Alexander, is the Falklands' only 'defector'. He tells David Usborne the referendum is pointless". The Independent. Retrieved 16 October 2017. The Toponymy of the Falkland Islands as recorded on Maps and in Gazetteers The Permanent Committee on Geographical Names for British Official Use. Wikimedia Commons has media related to Stanley, Falkland Islands.